The very exciting Kings Puzzle quilt was brought out again last week. The quilt guild was lucky enough to receive a presentation about “something blue” by a local quilter – Barb Eikmeier. During that presentation Barb showed a blue & white version of the King’s Puzzle quilt by Lois Hattleberg. Lois & Barb are friends. 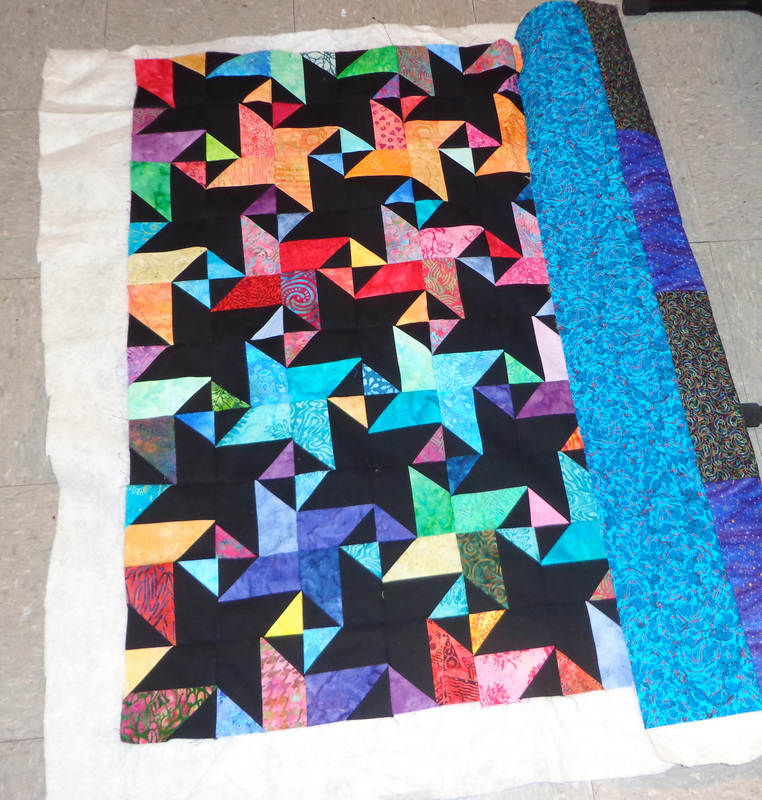 Lucky me that I was able to show my red and black version of the same quilt top at the meeting Barb attended, so she got to see the version I made. And I opened my mouth & said something about making borders at the retreat the following weekend (last weekend from this time frame). So I brought the top, and an assortment of deep red fabrics, and my graph paper. The first evening of the retreat, just doing some drawing & some thinking I think I figured out what I want to do for borders for this top that will compliment & hopefully not detract from the wonderful piecing of this top. Since the Kings Puzzle quilt in a bargello style quilt, mimics the style of an orange peel design, I looked at the red fabric with orange peel pieces that also reminded me of a cathedral windows quilt setting. And I have made a cathedral windows style quilt with the 10 minute block method before! So I came back to this quilt on the last day of retreat (had a few other things on the ‘had to do’ list first), and started thinking & playing with scale & design. I have cut the center pieces of the cathedral window blocks, I actually am going to make a change to my first cuts so I can border the cathedral windows differently on some blocks, but I am still using the bright red fabric in the centers of the blocks. I am going to make an outer border & an inner border of red that have some of those cathedral window blocks in between. I wanted the very outer border to have a darker red border. I have two acceptable options. Option #1 – the best option right now. A close up of the same fabric (colors slightly off due to flash etc). This is what I like best right now still. But this next fabric would be nice too, I think. I don’t have enough (yet) of this fabric, but I like the darkness of it more. But not so much the chevrons (doesn’t work as much in THIS design. Or the thing seems very purple to me too. I have been thinking about next year’s regional quilt show, and wondering in the back of my mind if I can push through all the way to finishing this quilt to get it done before the deadline for that show. This is one that speaks to people a lot. 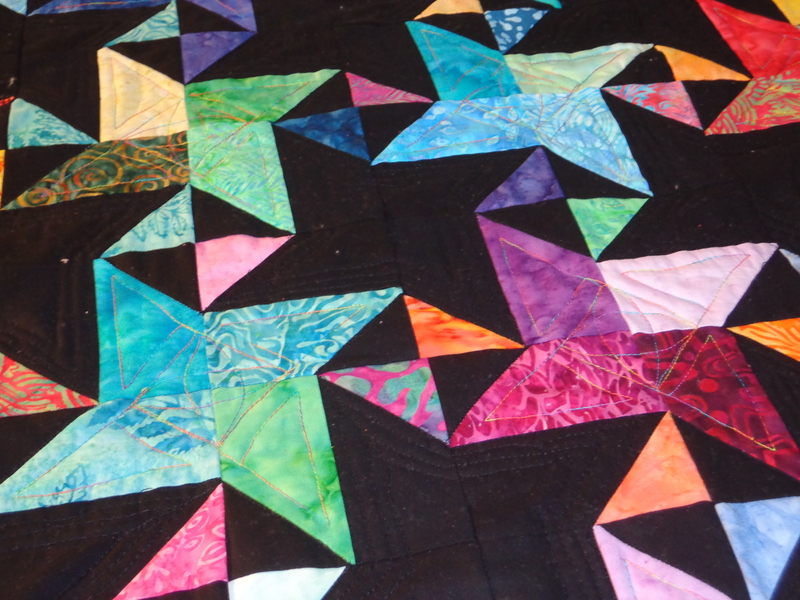 If not, I will try to enter my exothermic wonders quilt in the regional show. If they let me. 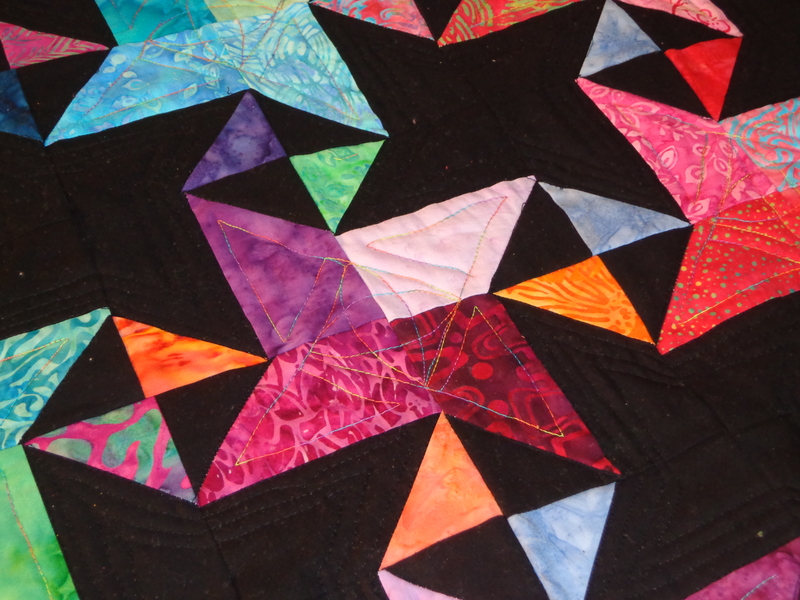 The finish date for “Exothermic Wonders” was Christmas 2012 so by June 2015 it will be 2.5 years old which is .5 years out of the ‘acceptable quilt age’ for this particular show. So maybe not. Better press on with King’s Puzzle. Slow & steady is how we win the race. Every weekend I have done something that has a little bit of progress. Last weekend was sewing the back & basting. 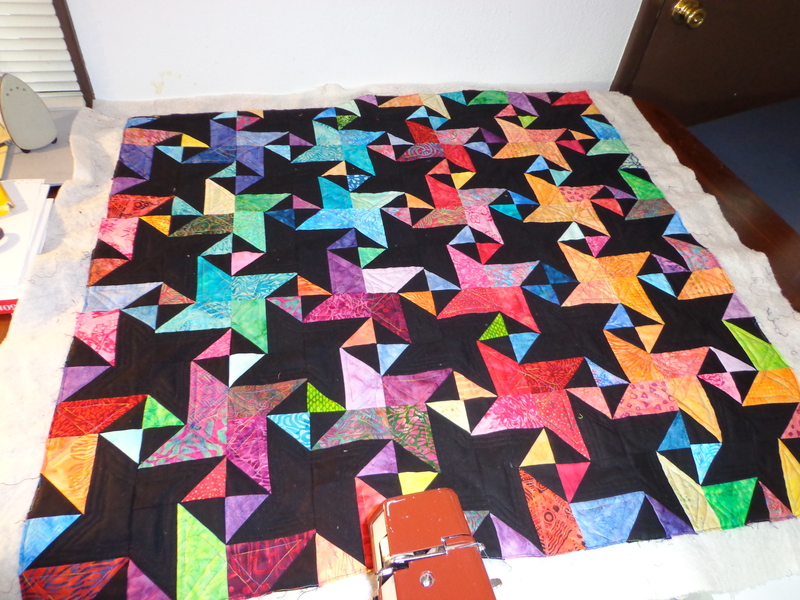 And the middle of the black stars are left unquilted. 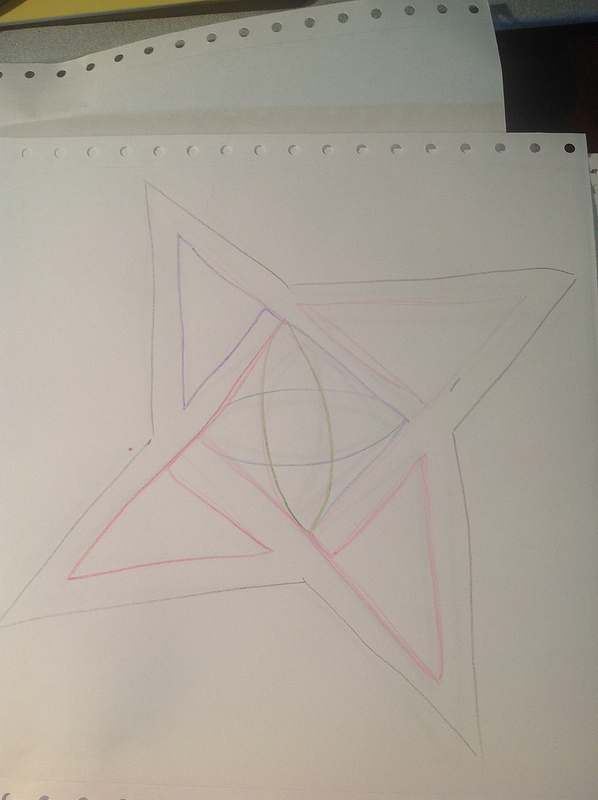 Thursday I worked up a tracing of the quilting for the multicolored stars and drew the design on paper several times. This built in its own backtracks into the design just fine, but keeps the design within the center of the stars. This could have worked for the black stars too if I had come up with it before all the echo stitching. And it works fantastically on a quilt. The multicolored thread I put in both the bobbin and the back as the original black thread was showing too much. This was the first time I had used king tut brand thread, and I don’t know if it was my machine, my needle, my constant tension problems, but I didn’t like it half as much as aurifil. If only I could find these large spools of variegated thread in colors I adore & would use! I need to start looking for some, I had several broken threads. As you can see I stitched the lines by hands, no rulers templates or walking feet. I recently downloaded a craftsy class about template quilting, and after watching the first 10 minutes, I thought it was a nifty idea, but I had the problem of having a darning (quilting) foot that is not symmetrically surrounding the needle. Maybe later in the class there is something about how to transfer all the longarm stuff to domestic machines. Maybe. If not, I have the class for “way in the future”. The straight lines of the template rulers really appeal to me. I remember there was a category “tools of the trade” at last year’s MQS show which the quilts had to be made with rulers or other tools on the long arm or they wouldn’t qualify for that category. Now I can visualize how that’s done. Anyway, here’s a picture of the baby quilt as it stands now. Patiently waiting for the ends to be cut off and the binding sewn on. The binding is picked out and I just may get that sewn & pressed later tonight. And here’s one more picture of the quilt a little more close up. I need to take down all my overhead lights and clean them, my house seems very dark if I don’t have external lights going on, and this is proving weird color sheens on my quilts. The secondary hourglass patches will not be extra quilted except for their stitch in the ditch. I need to start up talking to my cousin and see if she’s still interested. If lucky, I can get this finished by next weekend or so, only a month and a half late. 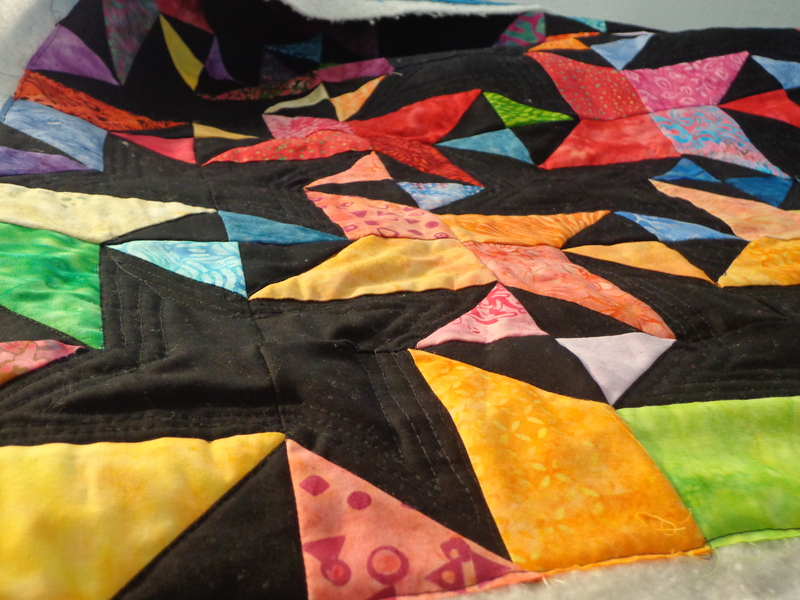 Otherwise this quilt could really find a place to stay here …. And for people reading my blog in ‘real time’, who saw and responded (or thought to) to my last post about my decisions. I know I am overthinking things too much. If you know me, you know this should not surprise you. I have sent a couple of emails to people, and no I haven’t yet replied on my own post in the comment section myself. I did worry a few people with the ‘tone’ of my last post. And this is a true tone. I have been obsessing over something that I shouldn’t be obsessing over for almost 2 months now. And I do always feel better when I write out what’s bothering me. Nonnie suggested that I try to blog positively from now on, and I may take her advice to the next level and start my own journal. Since I do a lot of my thinking while writing out things, this may be a better way to express my doubts instead of putting them all out there for you. However, this doesn’t mean that a journal will “make everything better” or that I won’t take things too personally in the future as I did in this case. I am trying to take steps to figure out how to handle things that bother me, and boy do I do the wrong thing about that most times. But I have made a couple of changes already in the last week that I hope will help my frustrations at least temporarily. And I wouldn’t have made those changes if I hadn’t posted about how I needed to make decisions. And I want to learn how to make even more changes to help me out. It gets scary to see that I face the same demons that I faced several years ago in terms of fear over the podcast. I have to battle within myself over something that 3 different bosses have told me is holding me back (maybe 4, I forget). So maybe like most people, I don’t really WANT to change. And if so I have to figure out how to be OK with that. I do need to make small changes, small experiments, and see how things go. I still need to think about the direction, duration, schedule, and type of quilting podcast I want to make. People seem to keep telling me that they like the “just talking part” of podcasts, and for me, those are the longest & least thought out, most rambly, and unstructured parts of my own podcast. The topic part, yes I probably do go on and on, but I do cut the topics off WAY before I cut off my own quilty rambly thoughts. Honestly … I find myself scared / angry / frustrated / nervous to lean towards doing a podcast with “only the home sewing front part” that everyone seems to crave. And then, I worry too much about that whole thing all over again. So perhaps a compromise is in order, sometimes topic, sometimes just talking???? This is a thought anyway. Which is why I am sitting down and trying to make the decisions before I record again. And I still plan to “March-A-Long” in March, doing 15 minutes every day quilting during the month of March, I still plan to podcast the March A Long weekly like last year, I still plan to highlight others who are marching along with me. Well, I’ll keep thinking, and you keep sending me good thoughts. And I’ll try to be better at mirroring those good thoughts back. Welcome to the Scientific Quilter. The theme is quilting with a science, math and complicated quilting design emphasis. I USED to have a podcast called Scientific Quilter. Many old blog posts may refer to podcast episodes. The podcasts have been removed and old blog posts have not been updated. I am always looking for new science and math inspired projects, or a good experiment on quilting techniques. Feel free to contact me with your ideas! 1. Comment on a post or page.